Has anybody removed a water pump assembly before...? It would not be a normal type of item that would be replaced, but I have a brand new replacement right side engine cover, which does not come with the water pump assembly. I am ordering a new oil seal (for the bearing) and what Honda calls a "Mechanical" seal for the water pump shaft...but the water pump has a ceramic seal that contacts the mechanical seal....which has a line (Crack?) going through it. Is this normal or did the ceramic seal crack when I pressed it out? Take a look at the Pic. I've done a few dozen. The ceramic seal in your picture with the crack is no good. Use that and it will leak. 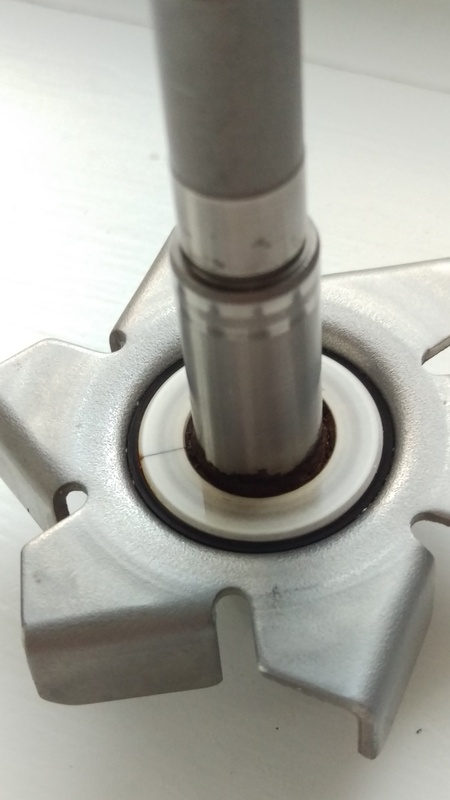 Remember when pressing the impeller back in, you have a very small margin for error on installed depth. Get it wrong and the impeller rubs the case or the cover.